Placing a temporary diversion tarp on the San Luis People's DitchWater law in Colorado is complex and there are circumstances under which an irrigator can lose their water rights or be adversely impacted by a change of use within the watershed. To a small-scale farmer, water is wealth–the means by which you support your family and the means by which you participate in your community. However, the process through which a farmer must go to defend his water rights, either in an abandonment challenge or as an intervener in a change of use proceedings, can be costly and time consuming, requiring technical and legal expertise beyond what an individual farmer can afford. Our culture is one in which knowledge is shared orally, from generation to generation. 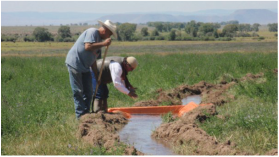 While this strong oral tradition has meant that acequia knowledge and sustainable farming practices have been passed down for nine and ten generations, the oral tradition has also been a hindrance in the legal and administrative world of Colorado water. Acequias do not have written bylaws and often lack the diversion records necessary for proof of historic use in water court. Another problem facing acequias is the challenge of governance. Most agricultural ditches in Colorado are incorporated companies with recorded bylaws and leadership structures. One goal of this program is to support acequia governance through empowerment of its members and strengthened internal controls. Thus far, we have worked to draft model bylaws which can be adopted by acequia ditches and we are currently working to develop a governance handbook for Colorado acequias. Please see http://www.colorado.edu/law/acequia-assistance-project for a description of our partnership with Colorado Open Lands and the University of Colorado on this program. The SdCAA serves as mediating body for disputes between acequias (there are 73) and between individual water users. The all-volunteer board, which includes one member trained in conflict resolution, other acequia farmers, and respected community members, is typically approached by three to five different parties during each irrigation season. If this entity did not provide this service, these disputes could erode the fabric of these tight-knit agricultural communities. The SdCAA is currently serving as a fiscal sponsor for an unincorporated acequia in an application for funding to improve ditch infrastructure. While this is an important function, we plan to serve as a larger community organizing force to develop a comprehensive watershed plan for the Culebra Creek watershed, along with the Costilla Conservancy District.